The NHL started featuring at least one outdoor regular season game per year only at the beginning of 2008. For the first few years, they stuck to just one such game, the Winter Classic, played on New Year’s Day. 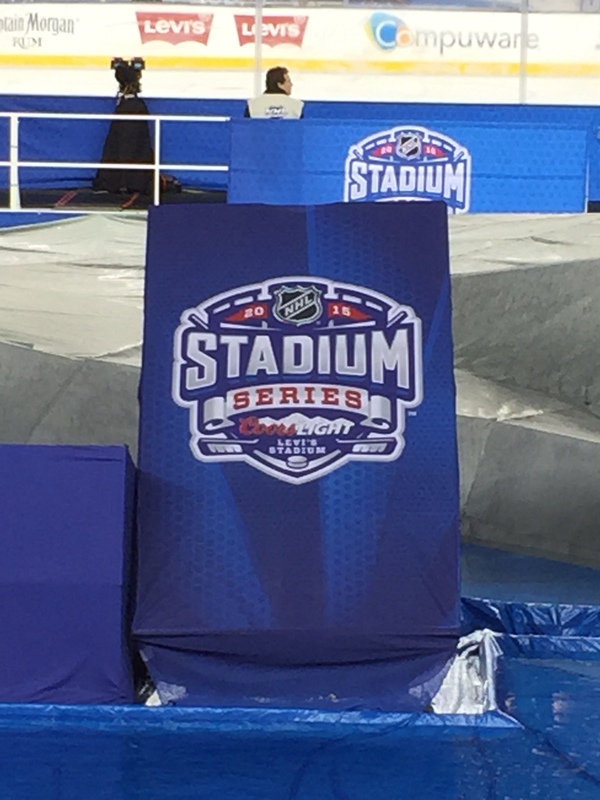 In 2014, they created the Stadium Series, which allows them to host a handful of outdoor games each season. So the concept is still relatively new and a limited amount of fans have been able to catch one of these games in person. This past Saturday night I became one of those fans. My brother was kind enough to take me with him to the Kings-Sharks game held at Levi’s Stadium in Santa Clara. Any sports fan should immediately say yes to an invite for an outdoor hockey game. It’s such a unique experience. For people in many parts of the United States and across all of Canada, the earliest memories of playing hockey revolve around a frozen pond, hand-me-down skates, makeshift goals and the biting winter wind attacking their faces. Playing outdoors in the elements feels right when it comes to hockey. On top of that organic, back-to-its-roots feel that comes along with an outdoor game, there’s also something really exciting about being part of an audience that’s three or four times larger than the normal crowd at a hockey game. It just feels more important. With only six weeks remaining until the NHL playoffs and the Sharks and Kings battling for the same playoff spot, this game actually was important. Throw in the recent history of the Kings winning two Stanley Cups in the last three years—including last season’s run that started when LA completed an historic comeback from a 3-0 series deficit in the 1st round against these same Sharks—and San Jose repeatedly underperforming in the playoffs, and suddenly we had a true rivalry game at a key point in the season with pond hockey at a state-of-the-art NFL facility as the backdrop. This event was going to be awesome, right? For the most part, yeah, it was fantastic. The Kings won 2-1 with a 3rd period goal being the difference. The game was pretty evenly played and both teams had plenty of great scoring chances. The weather was perfect: a little chilly so it felt like we were watching outdoor hockey, but not so cold to make it miserable for fans sitting in their seats for three hours. 1. Temporary Prohibition: At 6pm, about 75 minutes before the opening puck drop, some of the beer vendors ran out of beer. Look at all those sad empty boxes in the picture above. My brother and I were second in line at the time these workers announced they were all out of the only product they had for sale at their stand. 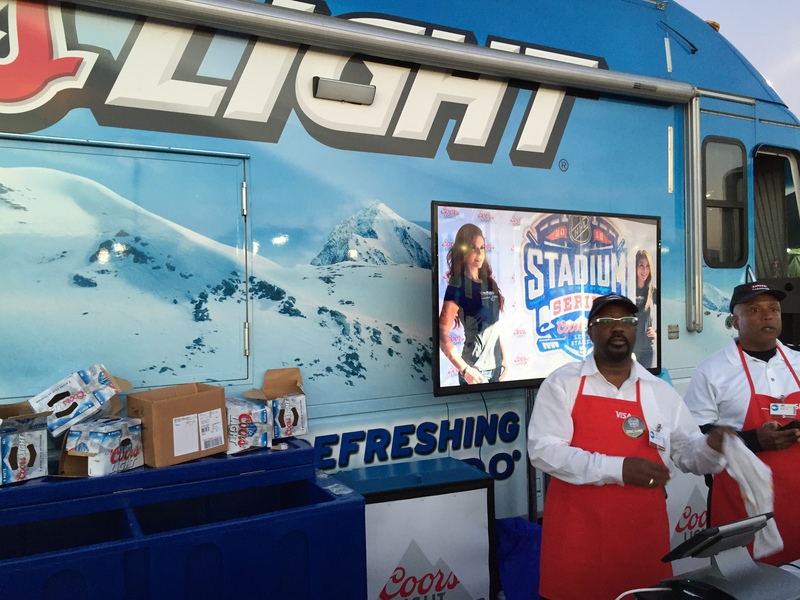 They pointed out another beer stand but said that stand already borrowed from them earlier, so they were probably low or out too. In fact, these guys were so unsure of whether or not any more beer was coming, they started handing money back to customers. That’s gotta be a worst case scenario for a stadium and a greedy sports league, right? You give money back to your customers due to inept employees or logistics, and you block people from getting liquored up, which stops them from making drunk purchasing decisions (more beer, lots of food, spontaneous merchandise transactions). Who’s running this league anyway? Roger Goodell? 2. “Easy Listening” as the Music Choice: The NHL has this rare opportunity with every outdoor game to make it bigger than it really is. In terms of the theatrics and entertainment, they should treat these events like the Super Bowl. Blow it out. Make the entire experience memorable, not just the game itself. So who did they roll out to get the fans fired up for hockey? None other than Kris Allen for the opening song & the National Anthem and Melissa Etheridge for the 2nd intermission performance. Everyone knows Etheridge and her style. And I’m sure you’d agree that hockey doesn’t really scream for her type of music. As for Allen, he’s a former American Idol winner who seems to specialize in soft, easy-listening, Christian music. Again, I can’t see any natural link between this artist or his music and a live sporting event or the typical hockey fan. It’s beyond mind-boggling. It was infuriating to have to sit through that crap. In fact, these performances were so out of place, it made John Fogerty’s 1st intermission set seem like the perfect fit for a hockey game. Fogerty was actually awesome. He played the Creedence hits, rocked out as hard as I imagine he can rock out, and seemed like he was having a genuinely good time. But the rest of the music was just disappointing. 3. Piped-In Sound Effects: My brother said it sounded like Michael Bay had produced the sound effects that were coming through stadium speakers during the game. And I think that’s a spot-on comment. Think about how lame it would be if a stadium was playing the audio/natural sound from the game being played over their speaker system. It’s just corny, right? The natural noises of the game should sound natural, not extra loud or enhanced. Well imagine if they didn’t even play the natural sound (of shots being taken, pucks being blocked, skates scraping across the ice) but instead created their own exaggerated version of what those game sounds should be. It was like listening to a lightsaber battle in Star Wars combined with the noises from a pinball machine. It was laughable, considering they were trying to play it off like those sound effects were simply the natural noises of the hockey game. Corny, over-the-top and terrible. 4. Bandwidth Problems in the Valley: Speaking of technology, the fans were repeatedly beat over the head with messages saying to download the Levi’s App for a special interactive light show during the intermissions (where, presumably, everyone’s lights/flashes on their smartphones would blink in rhythm with the music). Except in the heart of Silicon Valley, apparently 70,000 people can’t be connected to the internet all at once, even on “the Nation’s #1 networks” or whatever the stupid cell companies say about their 4G capabilities. I could hardly get Twitter to load once every 25 minutes let alone download an app that could take control of my phone. Do you think by the year 2075 humans will have fixed this ongoing problem of not knowing how to make the internet work when more than five people are trying to access it at the same time from the same location? Notice the size of the numbers (which was done on purpose so the fans up in the nosebleeds of this extra large stadium could see who was on the ice). 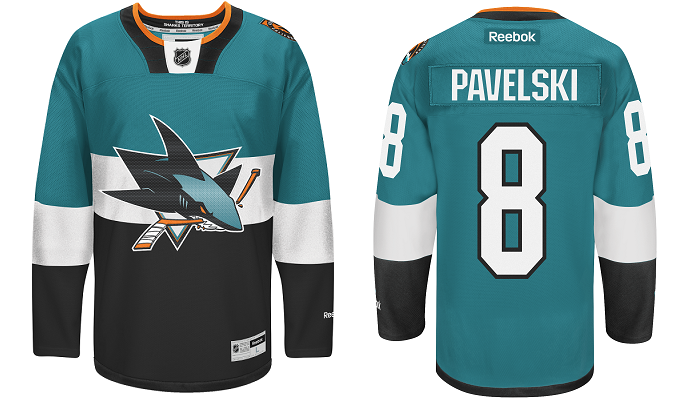 Also notice that the Sharks’ base color, teal, is just ugly on a uniform of any sport. Unfortunately they don’t have too many variations to choose from in their short history: Sharks Jersey History. Looks like they need to finally put a buck or two into having someone redesign their look and brand. This is supposed to be the NHL’s grand showcase. You think the NFL or MLB would have let a chance to roll out a classic or bold new uniform slip through their fingers on the National stage? This might seem like a minor detail, but I think it’s actually a pretty huge fail. So many more people would be interested in buying a commemorative Stadium Series jersey if, you know, there was something interesting and different about the jersey. And you know what’s cool? Real sharks swimming around in the manmade shark tanks that surrounded the outer edges of the football field (right below the first rows of seats). I didn’t do a good job getting a picture of these pools, but if you look back at the very first picture at the top of this article, you can see right in front of the Stadium Series sign is a little bit of water. They had these large pools scattered throughout stadium. Imagine a handful of great whites circling below everyone for the duration of the game? It would be a great feature, a rare thing to see, and an easy way to hold onto half your security budget because there’d be no need for people to monitor for fans running into the playing area (or other official on-field areas). They didn’t even bother with complete fake sharks. They lazily placed a couple fake shark fins sticking out of each pool and called it a day. How could they have screwed this up so badly? Here’s what I know: In 11 months, 100 million pairs of eyes will be on this same Bay Area stadium as the NFL hosts its 50th Super Bowl here. 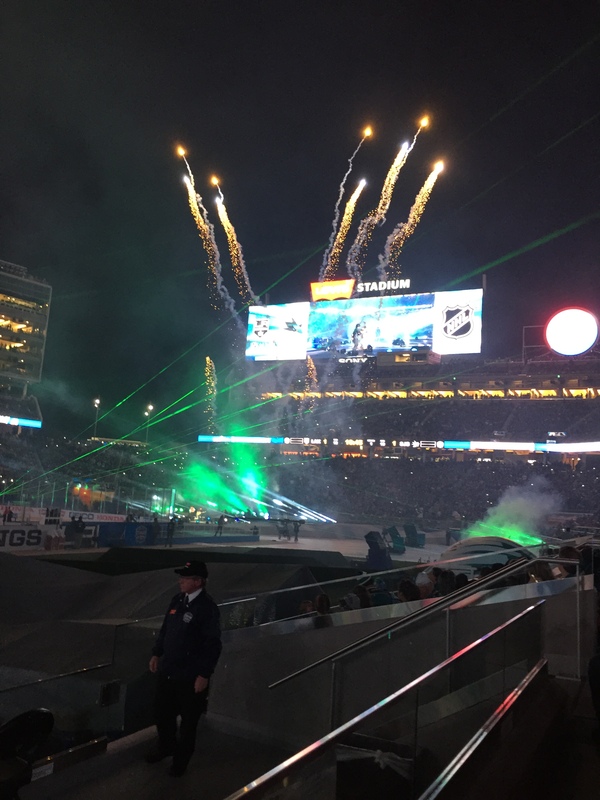 Of course the NFL has a much better handle on how to put on a show, so you can expect the music and the lack-of-real-sharks problem to be resolved. But Levi’s Stadium didn’t seem like a facility ready to host the world’s largest annual sporting event. We’re talking about a major NFL milestone with the 50th Super Bowl, and we’re talking about history as Tom Brady will likely be going for Lombardi Trophy #5 in his own backyard. Don’t screw this up for us, Levi’s Stadium. Well, well, well… look who pulled off a sweep in the second round of the NHL playoffs. That’s right, I did, your favorite guest blogger. I predicted the winner of all four second round series correctly. Before I basically give you free money by picking the semi-final winners, let’s quickly recap what happened in round two. Pittsburgh eliminated Ottawa 4-1. This series was never really close. In fact, if the five players on the ice for Pittsburgh in the last minute of game three do not collectively stop playing defense for eight seconds Pittsburgh probably sweeps Ottawa. After fending off a feisty Islanders team in round one, Pittsburgh apparently decided to take the playoffs seriously in round two and just go out and dominate their opponent. Ottawa may have fooled us a bit by how easily they eliminated Montreal in round one, but Montreal was probably more inured than they let on, and they let on that they were very injured. Boston eliminated New York 4-1. This series was never really close either. In fact, if Tuukka Rask does not forget how to play goalie in game four Boston probably sweeps New York. After the Toronto “almost a fiasco but really one of the great Boston sports moments of the last thirty years”, the Bruins, much like Pittsburgh, decided to get serious and end their second round series quickly. A couple of things factored into this being a quick series: just because one sucky team (New York) beat another sucky team (Washington), the winner does not all of a sudden become good; the Bruins three rookie defensemen added some much needed life into the Bruins and helped them dominate the series; and most of all, the growing legend of Krug. Los Angeles eliminated San Jose 4-3. The home team won all seven games in this series. It was a very well-played series with five of the seven games being decided by one goal. Los Angeles goalie Jonathan Quick is starting to look as unbeatable as he was during last year’s Stanley Cup run, and he really carried the Kings through this series. San Jose probably lost this series when they gave up the game-tying and game-winning goal twenty-two seconds apart with less than two minutes to play in game two. Chicago eliminated Detroit 4-3. Best series of the second round between two long-time division rivals that will not even be in the same conference anymore as of next year. Chicago dominated game one, and then Detroit came out and cruised through the next three games to take a 3-1 series lead over the West’s top seed. At this point Chicago came to life offensively and dominated game five at home, came from behind to win game six on Michael Frolik’s sick penalty shot, and then won game seven twice, once with one minute left in regulation that was overturned on a horrendous penalty call, and then a second time in overtime. Chicago v Los Angeles – Chicago wins if: They score on the power play and Corey Crawford does not give any games away. The power play is going to be particularly important for Chicago because Jonathan Quick is playing so well right now. I think goals are going to be hard to come by in this series. Also, if Chicago gets two or three goals past Quick in a particular game, Crawford cannot have a shaky game and give up five goals. LA wins if: Jonathan Quick keeps playing like he did during last year’s championship run. 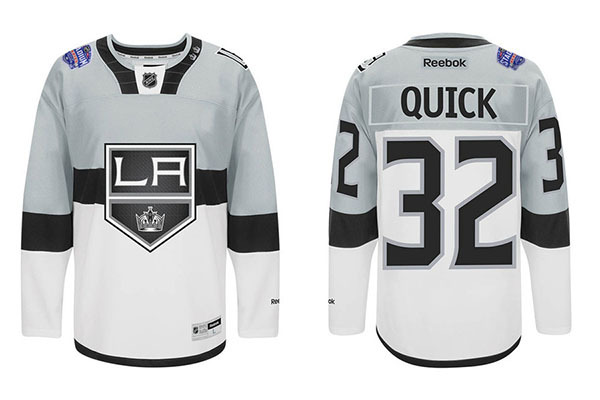 Listen, LA’s offense has by no means been lighting up the scoreboard this postseason, but with the way Quick is playing two goals is going to be enough most nights. And the winner is…: Chicago was the best team in the regular season and dominated their first round matchup against Minnesota, but showed some weakness in the Detroit series. Quick seems to be getting better as the playoffs go on. If LA was scoring goals at even an average rate during these playoffs, I could see LA winning a short series. The Sharks won three games against the Kings by a score of 2-1 in the last round. I see no reason why Chicago can’t grind out a couple wins like that in this series. I think this goes seven, and I want the better goalie in game seven. LA in 7. Pittsburgh v Boston – Pittsburgh wins if: They continue to play outstanding special teams and their offense continues to run amok. Pittsburgh has the number one power play in the playoffs and the number three penalty kill. Most of the time their power play looks surgical. When their five-on-five offense is clicking, they can make it look like they are on the power play even when they are not. They have three of the top four goal scorers and point leaders so far in the playoffs. Boston wins if: They continue to play the best two-way hockey in the playoffs and the rookie defensemen continue to play like veterans. The Bruins have the top four plus/minus players in the playoffs so far, and that is because when the Bruins are playing well the forwards are forechecking and helping on defense. Based on what I just taught you about Pittsburgh’s offensive proficiency, the Bruins young defensemen need to not only provide the youthful energy they brought against New York, but they have to play solid defense. And the winner is…: On paper Pittsburgh is slightly more talented and their offense really started to click against Ottawa. As good as the Pittsburgh offense is, their defense is a little soft. A couple of these games may end up being of the 6-4 variety, and I prefer Rask over Vokoun easily in those games. If you watched the Pittsburgh/Ottawa series, by game four it seemed like Ottawa was afraid of Pittsburgh. The one thing the Bruins will not be at any point is scared of this Pittsburgh team. In fact, I think the personality of this Bruins team is one that wants to go through Pittsburgh to get to the finals. I think there is a small part of Pittsburgh that wishes someone else took care of Boston for them. Boston in 6. Round One of the Stanley Cup playoffs is in the books. Glad you all made it through with all your teeth still in place. Before we dive into the round two series rankings, let’s recap what happened in round one where my predictions went right and completely ignore any predictions I got wrong. Chicago v Minnesota – As predicted this was a fairly uneventful series. The teams split two overtime games, and Chicago won the other three games easily. The most exciting thing that happened in this series is that Minnesota’s starting goalie got injured during pregame warmups for game one, so they had to go to their second-stringer at the last second. For those of you that do not follow the NHL very closely, players prepare for the goalie they are about to face similarly to the ways a batter prepares for a pitcher in the old man’s game (baseball): studying tendencies, strengths, and weaknesses. So anyone that got excited because Minnesota forced OT in game one and thought the Wild might make a series out of it was ignoring the fact that Chicago would study up on the new goalie and make the appropriate adjustments. Pittsburgh v Brooklyn – I was completely off on this series. This turned into one of the better series in the first round. The crowds for the games on Long Island were fantastic, which always helps elevate a series. I also did not see the Vancouver-esque goalie drama that was coming Pittsburgh’s way. Not that I thought their first-stringer, Marc-Andre Fleury was great, but I thought Pittsburgh would score six goals a game so the fact that he was giving up four a game wouldn’t matter. After Brooklyn had huge comeback wins in games two and four, Pittsburgh had to make a goalie change. The backup pitched a shutout in game five (see the pitcher analogy above) but started to let in goals in game six. It will be interesting to see how this plays out going forward. Pittsburgh won the two overtime games in this series which was probably the biggest reason they advanced with a 4-2 series win. St. Louis v Los Angeles – Here is what I wrote about this series in the round one preview: “In the last month or so the Kings have been getting back to form. I think this is one of those series that goes five or six games but seems like it was a sweep.” Nailed it. After losing the first two games, the Kings won the next four (which is essentially a sweep, right?) to take the series. All six games were decided by one goal, but other than a few late-game goals it was not all that exciting. Anaheim v Detroit – Not to keep bragging, but nailed it again. Here is what I wrote about this series before round one: “This series may very well go all seven games and we will probably get a couple of OT games as well. The reason this series is not higher on the list is that there is almost no history between the two teams and not a lot of household names on either team.” This was a fantastic series that nobody noticed. Anaheim erased a three goal deficit with 12 minutes left in game two only to lose in OT. Detroit came from behind and won in OT in game four to stay in the series, only to have the Ducks return the favor in game five. Anaheim scored two goals in the final three minutes of game six, only to lose in OT capping off three consecutive OT games. Again, great series, just too bad almost nobody was talking about it. Washington v New York – I stand by my statement that both of these teams are bad. What I did not calculate was that when two bad teams play each other they can cancel each other out and you might get an entertaining seven game series. As expected you have a ton of built-up hatred because it is two close proximity east coast teams. There were plenty of entertaining skirmishes and an extremely entertaining 5-on-5 brawl after the final whistle of game six. What ends up diminishing the enjoyment of this series a bit was that game seven was a giant dud. Vancouver v San Jose – Well, at least I predicted that San Jose would win this series. And Vancouver was nice enough to switch up goalies at least once, but this was not a very entertaining series. Vancouver never had a chance, which I understand for most NHL fans is nice to see since I think most non-Vancouvans are sick of this team by now. But in terms of playoff hockey value it was not a great series. And my advice to the Canucks – blow it up. You have taken a step back every year since losing in the Cup finals. It is time for a fresh approach. Unfortunately (or fortunately depending on how much you despise the Canadiens) Montreal blew a two goal lead with nine minutes to play in game four, eventually lost the game in OT, suffered some season-ending injuries to several players including their goalie, and Ottawa won the series in five games. 4. Chicago v Detroit – It is not that I think this is going to be a bad series, I just think the other three series will be better. Two of the original Six teams meeting in the playoffs. Both these teams have great fan bases and long histories. Detroit was unable to beat Chicago in four regular season meetings, but based on what we just saw in the Anaheim series and their history you never count Detroit out in the playoffs. I suspect the intensity of this series to grow with each game. The Pick: Chicago in 6. 3. Los Angeles v San Jose – Southern California vs Northern California, Dodgers vs Giants On-Ice, Snoop Dogg vs MC Hammer, I could go on for days. These two teams played four very even games in the regular season. As mentioned in the round one preview, the Kings seem to be rounding into title defense form very nicely. The Sharks are coming off of the only round one sweep. The Sharks have a nice little story going. This is their least hyped team in years and they just completed the franchise’s first playoff sweep. LA is not going to be caught off guard like the Canucks were though. The Pick: LA in 6. 2. Pittsburgh v Ottawa – On paper, Pittsburgh should be able to handle Ottawa in five games. That is what I thought about the Islanders too. Ottawa may not have the explosive offense that the Islanders had to keep pace with Pittsburgh, but they are a much more physical team than Brooklyn. And the crowd for every game in Ottawa should be going bonkers. And what happens if the wheels come off with the Thomas Vokoun experiment? Let’s not completely rule out Ottawa and their zany coach. The Pick: Pittsburgh in 7. 1. Boston v New York – All bets are off in this series. You’ve got a Boston team vs a New York team. I know most of North America is sick of that story line, but it is always a story line. Both these teams just survived seven-game series against lesser opponents. Somehow this is the first playoff series between these two teams in forty years. The Bruins had a better season and are probably a better team on paper, but, well, nobody is sure this Bruins team wants to try until their backs are against the wall. And New York has a very deep team that has played better the second half of the year. These teams played three very evenly-matched games during the regular season, and you know both fan bases are going to bring it. Let’s just fast-forward to the inevitable OT of game seven and see how it plays out. The Pick: Boston in 7. I know many of my readers aren’t in the LA area so they probably didn’t get to see the local news after the Kings won the Stanley Cup last night. Well even though it’s been more than seven years since I’ve gone out to riot after a sports championship, I couldn’t help myself and decided to head down to the Staples Center last night. 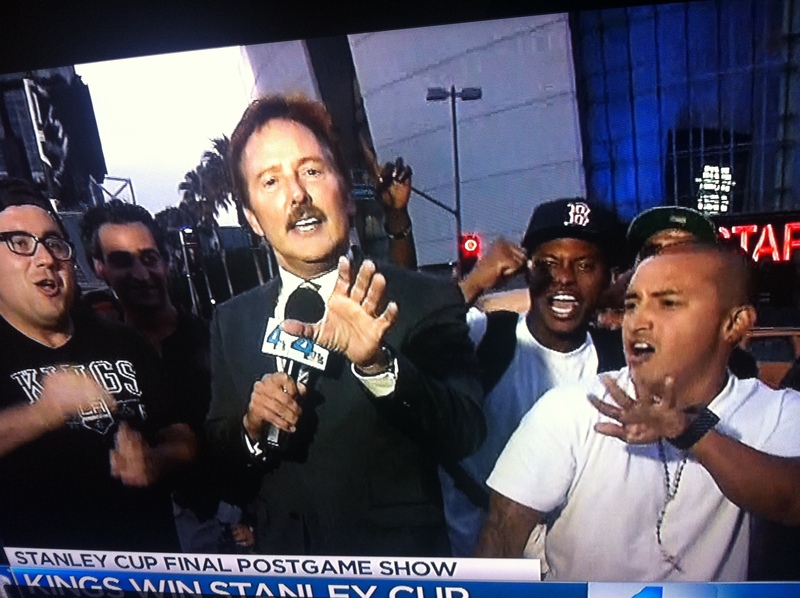 Here’s a picture of me just killing it in the background of this newscast. Obviously I’m the guy with the Red Sox hat on. So I decided to try out black face for the first time in my life too. Got a problem with that? Many people think of me as a sports jinx. It’s basically an annual tradition for me to tell my friends which new Red Sox player’s jersey I bought so they can groan about how that player is about to either be traded or severely injured. But facts are facts. All it took for the Boston sports teams to go on a never-seen-before championship run was me moving to Boston in September of 2001. Only five months later, the Patriots kicked off the Decade of Dominance with their first Super Bowl. Over those four years at Boston University, the Patriots won three Super Bowls, the Red Sox won their first World Series in 86 years, and the Terriers took home the Beanpot Championship three times. Coincidence? Maybe. But then I move out to San Francisco and only five short years later, the Giants are celebrating their first World Series Championship in like 50 years. And if we wanna go even farther back in my lifetime, didn’t St. Bernard’s High School make magical championship runs in Football (division six, but still) and Basketball once I enrolled? So when the LA Kings win their first Stanley Cup Championship in the team’s 45-year history tonight, just remember that I moved to LA six days ago. I’m the exact opposite of a sports jinx. I’m open to relocating to any city as a good luck charm as long as all my living expenses are covered by that city’s taxpayers. Who wants me?